Google recently changed the entire certification process which is now under the hat of the Google Partners program. So, if you want to study and sit for the Adwords exam, the first thing you’ll have to do is sign up for Google Partners and create an individual profile. 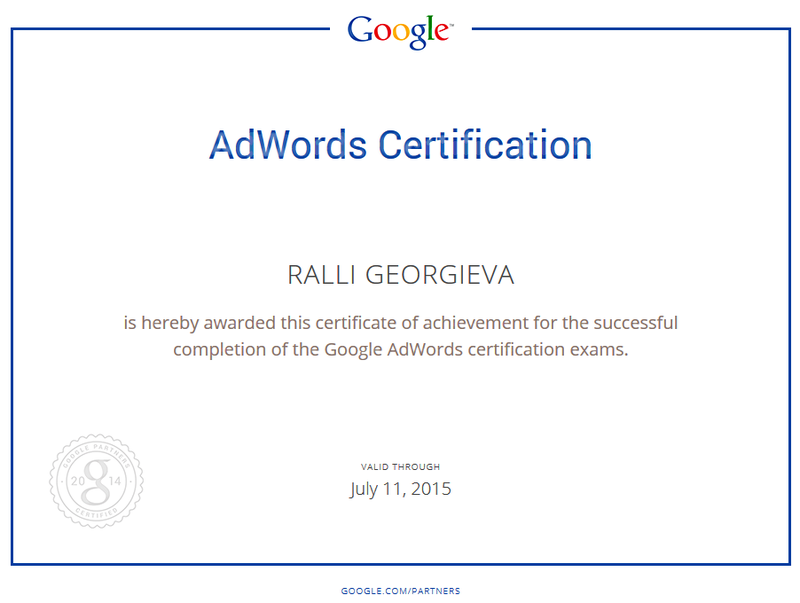 This will give you access to the AdWords certification exams and all related study material. In order to get certified you need to pass 2 exams: the Fundamentals (mandatory) and either the Advanced Search or Advanced Display exam. Taking the test is now free (it used to cost $50) and your only investment is the time you’ll spend for preparation. If you take the test and fail, don’t worry – you can give it a try again in 7 days. But in truth, Google wants you to succeed – that’s why they provide a very full and well-structured guide from which you should take full advantage. When you click on a certain exam, you’ll find all the lessons needed to prepare yourself for that exam. When going through the lessons, try not just to memorize the theory but to really understand the material, since the questions in the exam will then test your true knowledge and understanding of the topic. Write down the different formulas – you might be asked to calculate things like value-per-conversion, percentage of word-of-mouth purchases, etc. You surely don’t need to be a certified Google AdWords Professional to run a successful AdWords campaign. 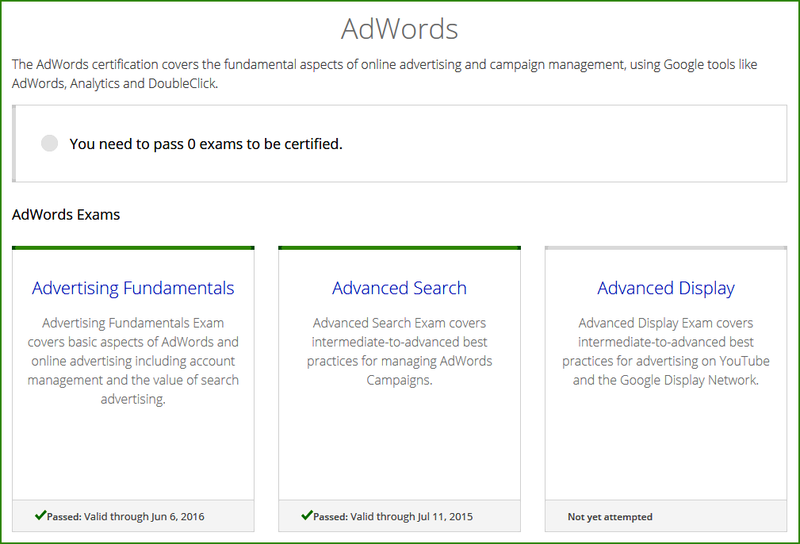 But if your job or business involves managing multiple AdWords accounts, then getting certified will prove you possess a certain level of competence and might help you get new projects. The client always feels more comfortable and is prone to invest a larger budget in Google advertising if he knows that his campaign is managed by a certified professional. In addition, AdWords is a complex and constantly changing advertising platform. Even if you have experience with it, you still might not be aware of all the different functionalities and features. And some of these can significantly improve the performance of your ads and help you save time on tuning up and managing your campaign. By going through the material necessary to pass the AdWords exams, you’ll find out more about the platform and the many possibilities it offers. Plus, in order to stay certified, you’ll have to retake the exams after a certain time (two years for the Fundamentals, and one year for the Advanced Search and Display exams) thus staying updated with the changes/new additions to the platform and refreshing your knowledge every few years. Btw, Google often offers $50-$100 coupons for new members, so they can freely experiment with AdWords. Just search in Google for ‘Google AdWords coupon’ or ‘Google AdWords voucher’ and see what’s currently available. Good luck with the exam and let me know how it went in the comments below!